So You Want to Build a Chanute Glider? The Chanute Glider has been copied and built by experimenters and hobbyists for decades. 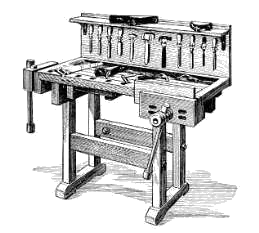 Indeed, Scientific American published an article in 1909 about how to build a Chanute type glider (see the Bibliography for citation). Over the past several decades, a number of replicas have been built for museums, and in 1996, three replicas were built for flying. While no published plans for the glider are available, Paul Dees, an aeronautical engineer, has provided excellent descriptions of his experiences building a Chanute glider. He wrote an extended article in the December, 1996 Hang Gliding magazine, a publication of the United States National Hang Gliding Association. An even more detailed and colorful article appeared in the EAA Experimenter's February, 1997 issue which is available from the EAA for $2 plus $2 handling. If you can't find these publications in your library, contact the organizations. Paul has provided this Chanute website with a summary of his experiences in building a Chanute glider, as well as his motivation for taking on this time consuming project. Paul welcomes inquiries. If you are serious, contact me for his snail mail address. 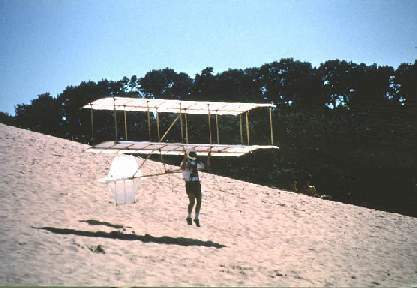 The picture below of Paul flying the glider was taken July 26, 1996 by Paul's sister Sue Dees at Warren Dunes State Park. All rights to the photo belong to the photographer, please do not reuse without permission. The Chanute biplane glider is a beautiful and simple aircraft. It set a trend in the structural design of biplanes that was followed and improved on for many years after it first flew. Compared to other flying machines at the time, it was in my opinion a masterpiece. Three early gliding pioneers died in glider crashes (Otto Lilienthal, Percy Pilcher, and John Montgomery). The Chanute biplane had hundreds of safe flights with no fatalities. William Avery did injure himself while being towed aloft at the 1904 World's Fair in St. Louis, so it did not have a perfect record either. Hang gliding is a risky sport, and any person interested in flying one should wisely invest in proper training from an experienced, established United States Hang Gliding Assn. (USHGA) certified instructor on appropriate training equipment. The Chanute glider is not safe for training, and is in every way inferior to 1990's equipment (performance, setup time, safety, handling qualities, cost). I built and flew my replica for several reason. First, to recreate history on the 100 year anniversary to honor our early aviation pioneers. Second, to learn about other aspects of aircraft design than my chosen field. Third, to experience a different aspect of hang gliding. It was really fun! My respect for Chanute, Herring, and Avery increased greatly. Paul's glider is now on display at Seattle's Museum of Flight which also has a reconstruction of the 1902 Wright glider. Not that ambitious? Perhaps a neat little paper model will do. Register at Fiddlers Green and you can download a pattern for free. Yes, the first three downloads are free!